I received a most lovely surprise last week. 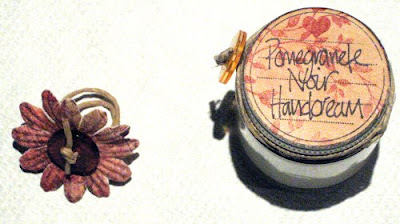 Jacquie, from A String Of Beads, sent me a lovely Pomegranate Noir hand cream that had the most incredible presentation. The handcrafted labels are adorable and the wrapping was secured with a ‘special little button’ that is fact becoming Jacquie’s trademark. Looking at the wonderful creations on her site, it is clear to see that creativity and attention to detail comes easy to her. Seriously outstanding. The cream is rich and glossy, yet light and so easily absorbed leaving the skin velvety soft, lightly scented and not at all oily or sticky. Because it absorbs quickly, it is great for using throughout the day to prevent dryness. Applying it more liberally at night the skin benefits from a rich envelopment of skin-loving ingredients, such as shea, cocoa and almond butters, so that when you wake up, your hands look renewed, feel soft and really comforted.